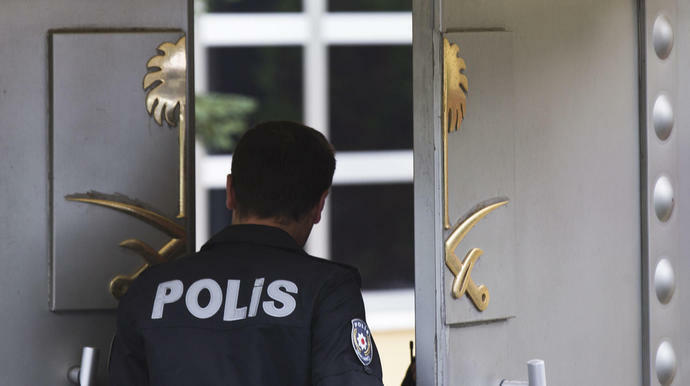 Saudi officials have contemplated announcing that journalist Jamal Khashoggi died accidentally inside of their consulate in Istanbul when an interrogation went wrong, severalnewsoutlets reported late Monday. The country planned to release a report claiming that Khashoggi's death occurred two weeks ago, according to The New York Times. One source told CNN that the report will most likely acknowledge that the interrogation happened without any clearance, promising to take action against those responsible. Khashoggi hadn't been seen since he entered the consulate to obtain marriage license papers on Oct. 2, and evidence points to Khashoggi having been killed and dismembered. Turkish officials reportedly said last week that they possess audio and video proof that The Washington Post columnist was interrogated, tortured and then murdered. Khashoggi had been worried that the Saudi government wanted him dead, The New Yorker's Robin Wright wrote last week. "Of course they'd like to see me out of the picture," she said Khashoggi told her. "Been hearing the ridiculous 'rogue killers' theory was where the Saudis would go with this," Sen. Chris Murphy (D-Conn.), wrote in a Twitter post on Monday. "Absolutely extraordinary they were able to enlist the President of the United States as their PR agent to float it." President Donald Trump said Monday that "rogue killers" may be responsible for his disappearance, adding that Saudi Arabia's King Salman "firmly denied" knowing anything about what happened. While he's expressed concern about Khashoggi's disappearance, he said he refused to halt arms sales to the country.